Xane's Blog: My Little ElsaGate #3 - This isn't good! never happens in the video...ElsaGate in a nutshell. ElsaGate...it's such a strange and sometimes disgusting creation. I still may not know the true intentions of the people that began it years ago, but I've seen videos recently talking about and showing different ElsaGate channels' videos and I've noticed they all have things in common, plus strange things that originated in the weirder live action videos. I'll talk about the things seen in the picture above as some of it is what you'd typically see in ElsaGate videos. First, let's explain about the name and common main characters! The reason ElsaGate has its name is because of the videos usually involving Elsa from Frozen, the girl that sang "Let It Go", the song which no one can let go. She's usually shown living with Spiderman, a totally unrelated superhero, who does inappropriate things in many videos. Additionally, the Joker from Batman appears, trying to do evil things, usually always portrayed as someone wearing a specific Joker mask. A cartoon version of that mask can be seen in the picture above. Now, I don't look at ElsaGate videos enough to know if Kinder's surprise eggs appear in those live-action videos, but they are another thing that merged into ElsaGate, initially their own videos about what was in the eggs. They can sometimes be seen in the cartoon ElsaGate videos, usually an obvious image with poorly-drawn wrapper overlaid onto it when it's opened, giving away how little artistic talent the animators and artists have, making me suspicion where they get the high-quality character art. Last, the thumbnails are usually misleading, showing events that never happen such as death, big tombstones with character's heads visible on them being very common. 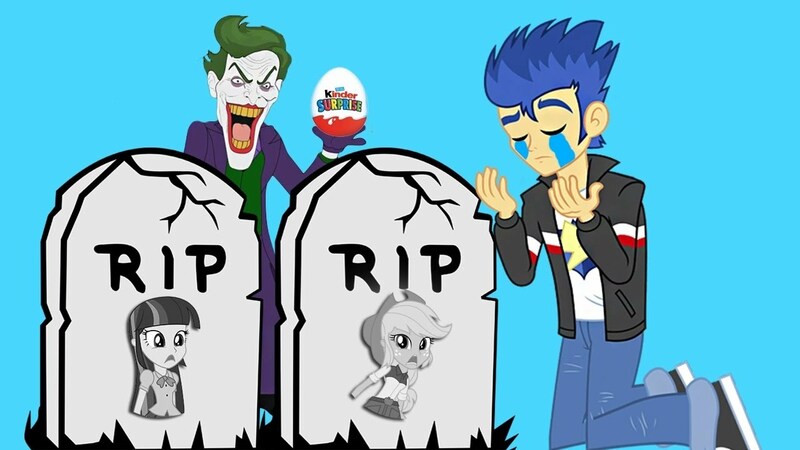 Also, math tests and bad things like kidnapping (with stolen fan art) are seen, though rarer than the tombstones with someone crying or mourning whoever's displayed on the tombstones. I feel ElsaGate's starting to get to my brain as I don't feel right. It's like a small rage inside me. If these videos are beginning to drive me, an adult, insane from the inside, then imagine what these videos do to children! There are problems with this series, though; They appear to use official or fan-made renders for accuracy, but this really affects the animation quality, which is mainly moving and rotating the images. This is unfortunate as it looked too good to be true! Therefore, I'll only leave a small post this time to explain a couple things. First, the surprise eggs make an appearance in the supermarket, though seemingly mirrored. Another thing is how Twilight Sparkle not only has a silly facial expression here, but she also is not in an appropriate position to "run", so she appears to skid across the screen like someone braking in a 2D platformer game! Additionally, while other characters appear, the same things are attempted, like how this girl (who's not Adagio) tries what Adagio tried in the other series, to knock out Twilight Sparkle using an apple by dropping a potion onto it. However, this time it affected Flash, meaning if I can give this series any credit other than the accurate character designs, it's that it doesn't have Twilight Sparkle constantly beating Flash up without any defense, the babies are ponies rather than dwarf clones of their parents, and they try slightly different things from having another girl who tries to harm and kill Twilight Sparkle, never affecting Flash. I don't think it's worth looking at this series since I now know it's just a bunch of images animating, and not in a good way. I'd prefer the iffy-but-cute other Twilight Sparkle, even with her anger management problems; At least she animated like a proper cartoon character! Yea these people r twisted to say the least and to Target young chikdren is just sheer ignorance and stupidity for the sake of ratings.. I agree, she really is the only good part, and only her appearance for that matter, as her behavior doesn't fit her cute smiles. As my mind's story goes, once she comes here, she'll change her ways, being out of that world.